WordPress has become a cluttered mess with thousands of plugins and hot fixes, such that even the simple things, like transfering your WordPress site to a new domain, come with dozens of bugs. This serves as a guide on how to make a domain change carrying over your Wordress site while fixing the bugs I encountered. You want to transfer your posts, pages, media, and plugins to your new site. WordPress made this easy, you login to your dashboard and go to “Tools -> Settings -> Export”, check “All Content” and click on “Download Export file” to save a backup of your contents. Login to your dashboard of your new site and go to “Tools -> Settings -> Import”. There, you see several importer plugins, none of which are installed by default. We will use “WordPress”, so click on “Install now”, after that on “Activate”. You can now “Run Importer”, select your exported .xml file from step 1 and upload it. The posts will get transfered and will need a new author in your new domain, whom you can select here. Also, check “Download and import file attachments”. If you did everything right, the previous import should have imported all images used in posts as “Media”. However, if you actually look at a post, the images still point to “oldDomain.tld/image-path”. To make them point to your new domain, we will use the plugin “MediaTools”. 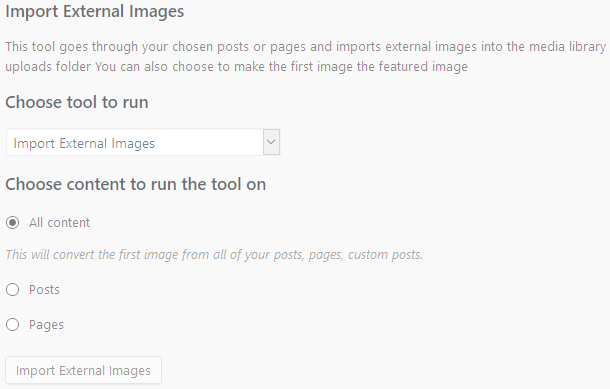 Install and active the plugin and go to “Tools -> Media Tools”, choose the “Import External Images” option pictured below. This will search your posts/pages for image links and replace them if it finds a matching image in your Media library. This is what worked for me. Be sure to uncomment the line in “wp-includes/post.php” if you changed it in step 1.1.